Will my new storage room generate income for my building? We can provide you with a sample 5 year Return on Investment scenario based on typical monthly storage locker rental fees in your area. Let your building's valuable common areas work for you! Unlike renting storage units from other companies that keep up to 75% of the profit, purchasing storage lockers from Giant Industrial Installations allows your building to keep 100% of the revenue generated for the life of the lockers! What is the typical "payback period" when purchasing storage lockers for my building? In most cases, when charging tenants typical monthly storage unit rental fees, you will recoup the cash outlay for the storage lockers in 10-12 months! What is the most popular storage locker size? The most common size for storage lockers is 3' x 4' units. There are no size limitations - our Condo Storage Lockers can be made to any size to fit any room configuration. What are the advantages in choosing wire mesh over solid panel storage lockers? Wire mesh storage lockers cost less than the solid privacy units, offering a better return on investment. Also, the visibility allowed by wire mesh storage lockers helps management prevent the storage of flammables and other dangerous items. Wire mesh lockers also allow for the use of existing lighting and air flow. Why do buildings choose solid panel storage units over the wire mesh storage units? Although it costs more, some buildings offer the solid units to their tenants for the extra privacy. This prevents others from seeing what is being stored in the storage unit. Do double-high storage units cost more or less than single-high units? Double-high units cost more than single-high units because of the cost of the added solid steel divider and the extra steel required to fabricate the double door frame. What is the lead-time to furnish and install storage lockers? In most cases, our standard lead-time for a typical project is about 4 weeks from the time we receive your required deposit and signed documents. For smaller projects, we can usually install within 2 weeks. Do your storage lockers require any maintenance? And what if I have a problem? Our storage units are maintenance free and backed by a 5-year warranty! The standard color and finish for most products is a powder coat gray. 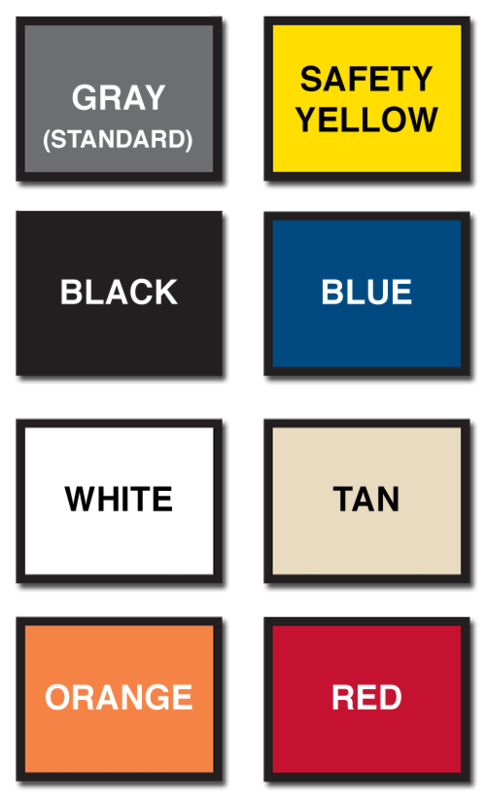 For an additional cost, you may order products in the color of your choice using our color chart. Alternatively, we can also match a color chip that you provide. Are storage units attached to the ground or installed on a platform? As part of a standard installation, storage units are anchored and attached to the existing floor. However, above the floor options are available. Are flooring options available for storage units? Flooring for storage lockers are available as an option and are typically utilized in applications where water and/or moisture is a possible problem. Floors can be galvanized steel planks or 3/4" plywood floors raised on treated studs. Can storage lockers be raised above the floor with "legs"? Yes, storage lockers can be raised to a desired height above the floor where water and/or moisture is a concern. Are storage locker ceiling panels included or optional? Ceiling panels are optional and are available in either wire mesh or solid steel materials. Are back panels required for the installation of the storage units? Back panels are required for storage units being installed in the center of rooms, along bad or uneven walls, or along walls that have a lot of existing obstructions. In other cases where the building walls are acceptable, attaching units directly to the existing perimeter walls saves the purchaser money on materials and installation. Can installation be Union labor or Non-Union labor? What is the lead-time to furnish and install the Bike Storage Racks? Bike storage has a quicker turn around than storage units - we can usually install within 2 weeks of processing and order. Unless otherwise specified by the customer or by the stock finish description on our website, all products come in our standard gray finish. *Note: The colors displayed on this website show the variety of optional colors kept in stock. Users should not place orders based on the colors as reproduced on their computer screens as these may vary from the actual color. Please request a printed Color Chart before making a color selection.